This Sailor’s Multi-tool Duo set is a lightweight alternative to a bag of steel tools. Put 7 wrenches, 4 shackle keys, two screwdrivers and a bottle opener in your pocket with two lightweight & rust-resistant* tools. This Sailor’s Multi-tool Duo set is a lightweight alternative to a bag of steel tools. Put 7 wrenches, 4 shackle keys, two screwdrivers and a bottle opener in your pocket with two lightweight & rust-resistant* tools. They’re easy to store and made of tough Delrin®, a high performance plastic. Sure, it won’t replace wrenches for really cranking down on something, but two of these are much more convenient to carry and store on the boat than a tool box. Nobody wants extra tool weight on board while racing. 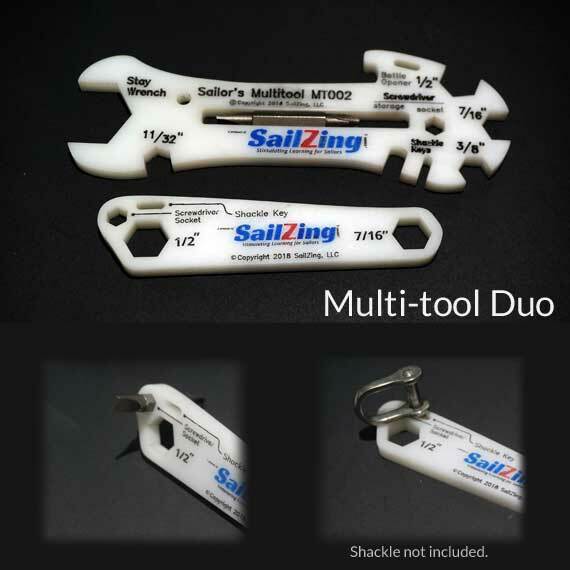 We designed the Multi-tool Duo by asking our fellow sailors what wrench sizes they needed most for the scows and dinghies that we sail. They thought of nuts for gooseneck fittings, cleats, sidestays, StayMasters®, rudders and more – 11/32”, 3/8”, 7/16”, 1/2”, & Stay. Then we added shackle keys to loosen tough shackle pins, a Philips and slotted screwdriver bit and even a bottle opener. There’s even a hole for a lanyard for those worried about dropping it overboard or to lash it to the boat or drybag. *The multi-tool is rust-proof, but the screwdriver bit may rust over time if exposed to water. It may be a good practice to wipe it down if it gets wet. 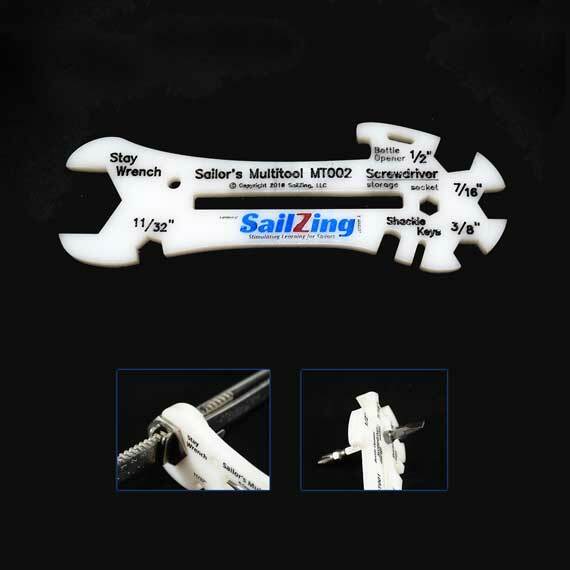 This is regular SailZing Multi-tool plus a companion micro-tool mini MT003. Save money over buying two Multi-tools.